What should the kids wear? Are we all supposed to wear the same color? Is that no longer trendy? I want to be trendy. I think the baby needs some mint pants. Mint is in. Maybe mustard would be better? Do I have a top to match that? Are we supposed to match? Shoot. Is that a zit on my daughter? One ME?? Can the photographer edit that out? What if the baby looses it? And there is no way my son is going to sit still. How is the photographer supposed to get a picture of him if he will not stop moving. Are our smiles going to look cheesy? We have nothing to wear. Do we all need new clothes? Where can I get matching outfits? Are we even supposed to match!?! 1. Let the match-matchy-what-do-we-wear-thing go. Just let it go. Three things to consider, then forget the rest. 1. Being perfectly the same color is practically impossible. additionally, it doesn't actually photograph well. Coordinating colors are amazing. Look for clothing items that compliment each other, not an exact match. Love this family. Amazing blues and creams. We focus on the family and not their clothing. Why? Because the colors compliment each other, but they do not look like a giant blob of color. 2. Avoid too much pattern. Again, it distracts the viewer from you. Whether you are handing out your senior pictures, or framing a family photo for great-grandma's mantel, your lovely face(s) should be the center of attention. 3. Try to avoid blacks and white. Perhaps just personal preference there, but I like finding other colors. Call me crazy. These are mere suggestions, not hard and fast rules. So relax. If you are stressing out about clothes, then you are thinking far too hard. Your whole family can tell when you are stressing out. Your kids are on edge, your significant other can't relax, and your face looks a tad ridiculous. Enjoy your session. A skilled photographer can get fabulous photos while your child runs the other direction, is distracted by a rock, or even when she is sobbing. It is the photographer's job to get quality photos, not yours. Take a deep breath and feel the weight of that responsibility go. 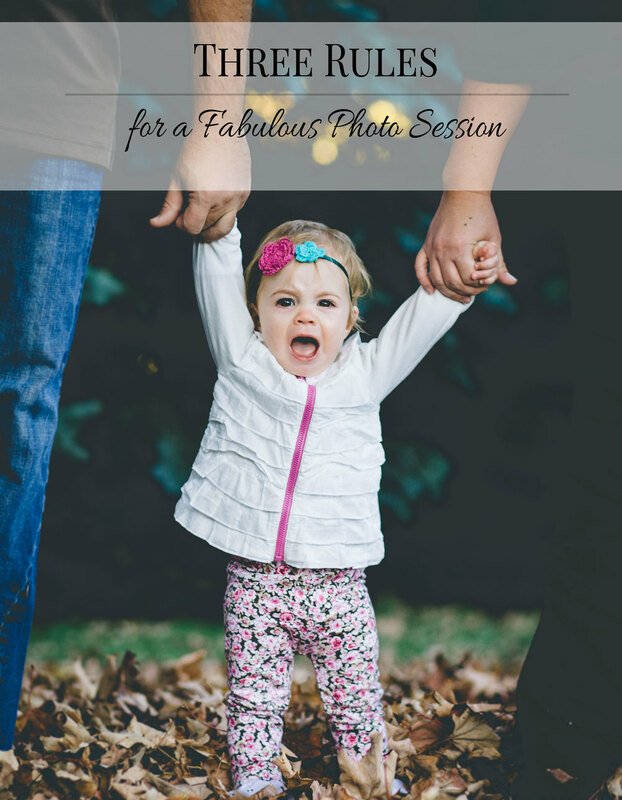 Even if your family can't pose or smile or whatever you are hoping for, a photo session should be a glimpse into your season of life. If that means the best photo is a candid of your family laughing together, GOOD! When looking for family photos, put some time into choosing a photographer. Every photographer has a unique way of shooting and editing family, senior, and newborn photos. You can certainly give ideas and suggestions (in fact, I encourage it), but your photos will ultimately reflect the style of the photographer. If you love the portfolio of the photographer you hire, then you can trust him or her to put the same effort into your photos. As I said before, it is the photographer's responsibility to get quality photos. "Like" Danielle Geri Photography on Facebook. Looking for a photographer in Minnesota? Danielle Geri Photography provides family, newborn, senior, child, and maternity photography in Minnesota. Based out of Buffalo, MN, Danielle Geri Photography can be found picture-taking all over the fabulous Minnesota. Including, but not limited to, Minneapolis, St. Paul, Buffalo, Monticello, Andover, Maple Grove, Plymouth, Blaine, Dassel-Cokato, Maple Lake, and Plymouth.